The Conservative Party has announced that it intends to scrap Key Stage 1 and instead introduce a simple reading test. They also want to ensure that all pupils can read at the end of Year 1. Unfortunately, I have to disagree with my party over this. Children should be encouraged to read from an early age; this is without doubt, but setting yet more targets and pushing reading down the throats of young children who are not yet ready for it will be counter productive. I believe we start formal education too early in Britain. Children prior to the age of seven – in my opinion – should be taught to read and learn basic arithmetic in an informal, fun setting, as well as in the home. If you want children to learn you have to make sure they enjoy it first and that they do not feel they are failures. I hope this policy announcement will be open for discussion and then dismissed. My good blogger friend, Steve Green, who writes the Daily Referendum blog, referred to an article published on Labour Home entitled ‘Show us your vision, Gordon.’ Steve says it is a real eye-opener, and it is. I know Steve won’t mind me mentioning this, but he has become a Conservative Party member through blogging. He has become a Conservative after years voting for Labour. I too was born in to a Labour family and in my teenage years became a Conservative, as I could see that conservatism was the only way forward. I have referred to an article written by Martine Martin before, but I will let you read it again. It proves why the Conservative Party is the party of the future. In that great old 1946 film A Matter of Life and Death, pilot David Niven describes himself as “Conservative by birth, Labour by experience” just prior to leaping from his plane with no parachute – an action I can sympathise with if that sentiment were true. But what exactly does it take to turn someone from a fairly hard-up background (my dad was a Labour ex-coal miner and my mother ended up a single parent) into one of the “Tory Girls”? Here is a short step by step treatise on the making of a young Tory. The most important thing any government can do for any child is to give it the chance to succeed, whatever its social strata. The greatest mistake that New Labour has made with its culture of political correctness is to believe that by denying children the chance to compete (non-competitive sports days, anybody?) those with less aptitude in certain areas will be less discriminated against, and hence more will succeed in general. In practice the gifted ones lose out and the less academically talented are merely prevented from finding their real areas of skill and persuaded that they deserve everything they want without working for it. The result is entirely lose-lose. Social conscience has always been a Conservative trait no matter what the Guardianistas would have us believe. I know this to be true because the Conservatives once gave me a precious gift which I will never forget; a way out. Their Assisted Places Scheme, which was created in 1982 to help underprivileged yet academically talented children go to a private school, helped me get out of the education which saw my siblings drop out without even gaining GCSEs and into a specialist music school. Crucially, the money awarded wasn’t handed to me on a silver platter in the way Labour’s current money-grab deals are; I had to work, prove myself and get scholarships and bursaries off my own bat. Therein lies an important difference (it seems worthwhile to note that this occurred when I was almost 11. As John Prescott will no doubt tell you, that is the age at which long-abiding impressions of parties apparently form!). In 1997 Labour scrapped the Assisted Places Scheme. They did not quite succeed in taking back my award but the possibility caused me great distress at the time. I learned in that year that Labour may purport to stand for the “common man” but if it conflicts with their rabid hatred of anything they perceive to be remotely upper class then the common man can go throw himself in front of a train. Perhaps they thought I had sold out by digging my way out of the poor trap rather than just trying to drag everyone else down into it in order to redistribute, I’m really not sure. Labour has changed over time of course with the coming of New Labour. It is marginally less anti-elite nowadays, probably because those running it are from private schools themselves. The point is that it made me realise just how fortunate I had been and I still feel gratitude for the help I recieved today. It was reported the other day that by the end of this decade Blair’s top-up fees are almost certainly going to hit £5000 a year. Currently I am a student at Blackadder’s third great university, Hull. However had I been an entrant for this year there is no way I would have even bothered going to University at all. Since the gap between rich and poor has not been altered under the New Labour government, there can be no doubt that the children of less well off parents will be the ones to suffer, just as Michael Howard predicted. Not since the Assisted Places Scheme was demolished have Labour made such a great push towards educational inequality. There are thousands of places at various universities left untaken, and enormous levels of competition for relatively few others. Popular universities such as Leeds are not taking the top-up fee option. Others – coincidently the ones offering courses nobody in their right mind would take up – are already requesting further cash. The equation is not a difficult one. I only hope that when the renewed Conservative Party are ready to announce their policies, they will be able to do the maths and find the solution. Past experience tells me they will. So there you have it. It’s really quite simple. Education is everything. Had Blair really meant what he said when he talked about “education, education, education” in 1997, and had they actually improved the state education system to a level at which the poor do not require a helping hand to get a decent education, perhaps I would be more sympathetic to his party. The fact is, whilst they are simply too tied down into unworkable socialist policies to ever close the wealth gap, a future Conservative government could comfortably have the best of worlds; a helping hand for the poor-but-talented to get into specialist schools that will nurture their gifts set alongside a long term project to improve state schools as a whole with a deeper emphasis on vocational learning. I sincerely believe that the wholesale emphasis on academia is very harmful and causes those with more practical skills to get turned off by education, to the detriment of society. At the Built to Last Roadshow in Leeds (which I reported on here) David Cameron hinted at the beginnings of a policy to bring more career-based learning into education from the age of 14. This would equip children with a much wider range of learning – the example he used was fixing car engines, I believe – and give them the skills to get a well-paid steady job without needing a degree and the heavy burden of debt it now brings. The last Conservative governments created a new demographic of Tory Boys and Tory Girls from less well-off backgrounds who are now of the age to start making a difference in Conservative Future. Our next task is to prepare for the assembly of the next generation model… Conservative Future’s Future! Once back into power it is vital that our party makes fixing the education system at all levels a top priority and stand up to snide Labour suggestions that Conservatives only look after the wealthy. I and many others are living proof that this is simply not true. Yes, today could have been the date of the general election. The reason we are not voting is all down to the Conservative Party. If we had not had such a great conference, outlining sensible, popular policies, the British electorate could have had their say. 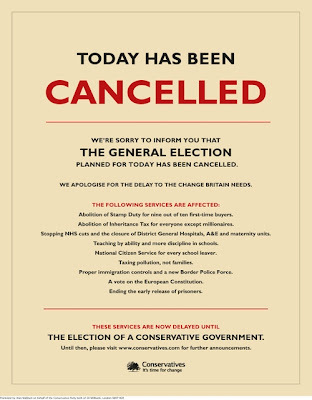 On behalf of the Conservative Party, I wish to apologise for offering the British public an alternative to New Labour and therefore depriving them a chance of change.